MT4GUI offers you a way to extend your Expert Advisors or Indicators with User Interface features. As most of you know MT4 does not offer the possibility to define UI for projects. MT4GUI has therefore been designed to fill this gap. This framework has been designed and tested for professional use. MT4GUI offers many different objects (for UI) such as buttons, menus, shortcuts, list boxes, radio and checkboxes. Beside visual objects it also offers many helpful functions such as the closing and opening of new charts. You can even use MT4GUI for closing the Metatrader terminal. This product is completely free of charge! MT4GUI is getting industry standard. Our offer comes along with extensive documentation and numerous examples Get started with the Quick Start menu and start your first UI just within minutes. As you know, Metatrader is based upon ticks from the market. A tick is a change of price. At the weekend, markets are closed and no ticks are available, which means that your Expert Advisor or Indicator stops working. MT4Ticker is our first software and it dominates the market among all available ticker tools. We do provide premium support and maintenance in due time. The way how the ticker system works differs in accordance to the MataTrader version. We as Fx1 Inc trust this tool and update it as soon as we realize that it does not work anymore. That is the main difference of the MT4Ticker. We stick to this tool and do not expect any income. Through the MT4Ticher you can deterime to which Metatrader terminal ticks should be sent to or not. It is able to manage an unlimited number of terminals. Since 2012, it has been able to detect crashed terminals and to restart them. This small feature may save you a lot money on the long term. MetaSetup is made for Traders and Developers. It is able to install your Expert Advisors, Indicators, Scripts and any MetaTrader4/5 related file on to clients computer automatically. It is completely free for everyone, beside free installation features, it also has premium features such as cloud installer, remote disabler, serial code licensing, data gathering and registrations. Did you ever want to store basic variable types such as string, double, integer to a persistent database and retrieve them? Unfortunately it’s not such an easy task with Metatrader. Metatrader offers the Global Vars concept, but this feature is just semi-persistent, GV´s expire after a while and they are not shared among different terminals. PermVar has been designed to fill this gap. It’s able to store an unlimited amount of data in registry. Data can be accessed through a Repository Name (it’s the main node) and variable names. PermVar is a single DLL file supporting the storage and retrieval of data in a persistent way. It’s completely free of charge and will be maintained by us regularly. Moreover, PV can be used via any other software such as Tradestation, Wealth-Lab, C# or Metatrader5. PV is not a dedicated Metatrader4 Application, it is just an extension of many different languages. This tool will help you to save many hours while Trading or Developing MQL Strategies. It can help you to Install Files, Edit Files, enable Ticker functionality, WatchDog and much more. Its worth to try this tool for free. We recommend you to watch this 8min introduction video to save you time while working with Metatrader4. MQLLock (ML) has been released after the suspension of Guardian. Guardian was our first approach to offer a working decompilation protection solution. After analyzing the market thoroughly, we decided to develop ML which shall cover all market needs. ML is highly effective and used in particular for Decompilation and Licensing Software on the market. ML ensures a remote and central control of your clients. ML exports most of your MQL source code into a DLL file and protects DLL with advanced techniques. ML also masks any remaining source code to protect algorithms. This Application is able to find reliable Trading Strategies for Forex, Equity, Futures traders. This tool can generate Strategies for Metatrader4, Metatrader5 and Ninjatrader. You can imagine StrategyQuant also as a tool to generate new trading ideas that immediately transforms these ideas into runnable EA. You dont need to be a developer in order to use this tool. This amazing tool can be yours for lifetime. This library is designed to fill the gap of some math functions such as Binary operations. In MQL and Easylanguage it is not possible to work easily with binary numbers. Use this library to work with binary operations. This is similar to the LogViewer2 tool. As many of you might know, Metatrader offers just limited debug capabilities. For complex development processes it is necessary to have the best debugging tools. Currently metatrader4 does not even support setting stops or going line by line. The only possible way to debug is to show variables on screen or print() and alert() functions. Alert is not capable to debug because it blocks the ticks which can be very annoying during the development phase. Print is the only tool for debugging but its output is mixed inside the terminal window with other outputs from all kind of processes. This was the reason why we decided to develop an ultimate tool for developers to debug their expert advisors / indicators / scripts with MetaTrader4. The MT4LOGGER tool is capable of rendering the comfort you want to your development. This tool is able to read HST Files from Metatrader4. HST files contain OHLC Data from particular bars. HSTViewer is able to visualize them. You may need this tool to verify or to read HST Files for different purphoses. This is a c# based tool which is able to re-format your MQL code. Use this tool to get a better overview about your source code. Since the release of this tool it is used by many mql coders. This tool is completely free and will be maintained regularly. It is capable of formatting MQL4 and MQL5 source codes as well. This DLL Library is able to communicate with Excel through MQL or other languages. You can export or import data from/to MQL, EasyLanguage or any other language and Excel. DLL has been written in c++ and has been optimized to reach higher speed. ExcelLink is capable of calculating and also formatting cells with regard to Font size and color. Library also supports sheets. You will find many examples about how to use this Library with MQL and EasyLanguage. Excel Middleware for Trading Applications. XLSgate supports newer Excel versions and it will be maintained. 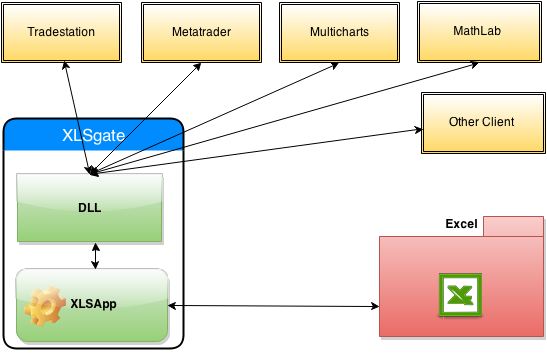 XLSgate is middleware application between trading apps and excel. It can build a communication bridge. Most of available Trading applications such as Tradestation, Metatrader, Multicharts, Ninjatrader, MathLab support using external DLL files, but they dont support using complicated COM Components such as Excel has. XLSgate is designed to simplify the bridge. XLSgate can be used from any application, it does not need to be a trading application. This is a comprehensive product to store/load key/value based variables into memory based database. Very light-weight product optimised for speed and quants. It works with all Trading platforms such as Metatrader,Tradestation,Multicharts,Ninjatrader,MathLab etc. It is completely free or charge and has superior maintenance. EASetup is able to create a setup wizard for your Expert Advisor and Indicators. It’s possible to install third-party DLLs, Exe, Wav or even source codes as well inside the same installation. This product was developed to fill an existing gap on this market. EASetup is written in C++ to ensure optimal speed. You can create projects, save templates and re-use them. EASetup creates an executable setup.exe file for you, which you can then hand out to your clients. Thanks to it you can also install files to multiple Metatrader terminals at the same time. Currently, it supports classic MT4, but we are busily working on new patches. EASetup has been designed as white-label, thus you can brand it with your logo and colors and give the products to your clients. The definition of Readme and License Agreements is easy as well.